One of the more commonly used materials used in manufacturing is sheet metal. One of the primary benefits of sheet metal is that is can be fabricated or bent and shaped into nearly any shape or thickness. The sheet metal industry is huge. Today there are 12,300 companies worldwide employing 600,000 workers who produce sheet metal goods worth over $732 billion. Due to technology advancements, propelled significantly by the automotive industry, fabricators are now capable of creating high-quality sheets for nearly any application. New tools are now used to facilitate the metal forming processes as well as cutting, perforating, slitting, and joining the sheets. When design engineers embark on the design of sheet metal components, many factors must be considered. They must determine the mechanical properties of the material, select the material that meets those requirements, and select the best fabrication process for the job. Then they must factor in aesthetics, cost, engineering, and manufacturing and assembly method. Inefficient sheet metal manufacturing leads to high levels of scrap and repetitive manual processes. Specialized sheet metal design tools are used to help design, assess the feasibility, and estimate costing of sheet metal components and guide engineers on how to reduce development time, material costs and number of prove-out trials. 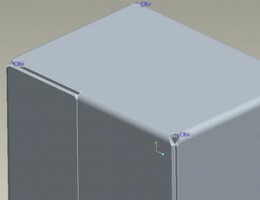 PTC Creo Parametric includes integrated tools that speed the design of sheet metal; simplify the inclusion of punches, cuts, fillets, chamfers, and extrusions that span sheet metal bend plates and more easily take into account manufacturing constraints early in the design cycle, reduce costly scrap, speed up assembly design and reduce overall design cycle time. They can also manage the forming process directly within their 3D design environment. 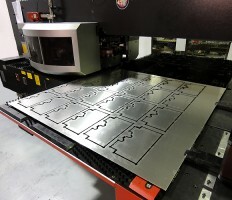 ability to modify a sheet metal part in the formed state saves time compared to Pro/ENGINEER Wildfire, where users would often have to create un-bend and bend back features to resolve similar issues. The conversion tool enables users to change existing solid parts into sheet metal with one simple click. During the conversion process, corner reliefs can be quickly added. The user can control the size, location, and rotation of the relief to meet with design requirements. A new sketch form tool has been introduced in PTC Creo Parametric. Users can sketch a shape and quickly create a form or a piercing. Taper and rounded edges can be easily added to the form and unneeded surfaces quickly removed. In Pro/ENGINEER Wildfire, users would have had to create a separate model to represent a form and then position it in the desired location using assembly constraints. The new approach is significantly faster. Other improvements include a new join tool to connect walls, flat walls which can be added and offset from any attachment point at any distance, and updates to bends and unbends which make it easier to build geometry. The sheet metal commands and workflows have also been standardized, so they now share the same user interface as the rest of PTC Creo Parametric.